The department is incorporating ophthalmology into the college's curriculum through the Center for Simulation and Innovation. 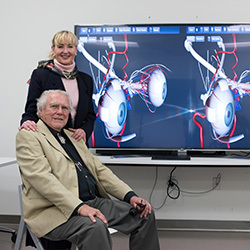 In 2017, faculty member, Donald Miles, MD, the most senior ophthalmologist in Phoenix, donated a state-of-the-art, virtual reality ophthalmic training simulator that is used in the medical students' training. ​EyeSim by EON Reality in Irvine, California, utilizes 3-D technology to show ocular structures, blood vessels, nerves and orbital bones. Animations can show blood flow to the eye and muscle functions, and students can be tested on identifying pupillary, cranial nerves and ocular muscle dysfunction. An interactive eye examination feature allows students to look at pupils, ocular motility and cranial nerve dysfunction in a virtual patient. It can also show students how brain damage impacts a patient’s vision. The simulator gives students hands-on experience in conducting eye exams using technology, instead of practicing on a cadaver.